Chris “C.J. Flash” Jourdan is an extremely talented D.J., songwriter, producer, arranger and musician. He produces everything from Hip-Hop to Jazz and is considered one of the Bay Area’s original Hip-Hop pioneers. His history as a DJ goes back to 1982 when he began experimenting heavily with the turntables. His popularity grew as a party D.J., and earned him a spot on what was then the Bay Area’s hottest underground music show – Music For The People on KALX 90.7FM in Berkeley. There, he teamed up with dynamic on-the-air personality Natty Prep. The show became the most innovative, ground-breaking music program of the 80’s in the Bay Area . This program also started the career of Hip-Hop Historian Davey D. C.J.’s musical knowledge expanded tremendously during this period. He also discovered he could produce music. Some of his early projects were writing for The Timex Social Club (Rumors), and producing for Raw Fusion (who later joined Digital Underground). 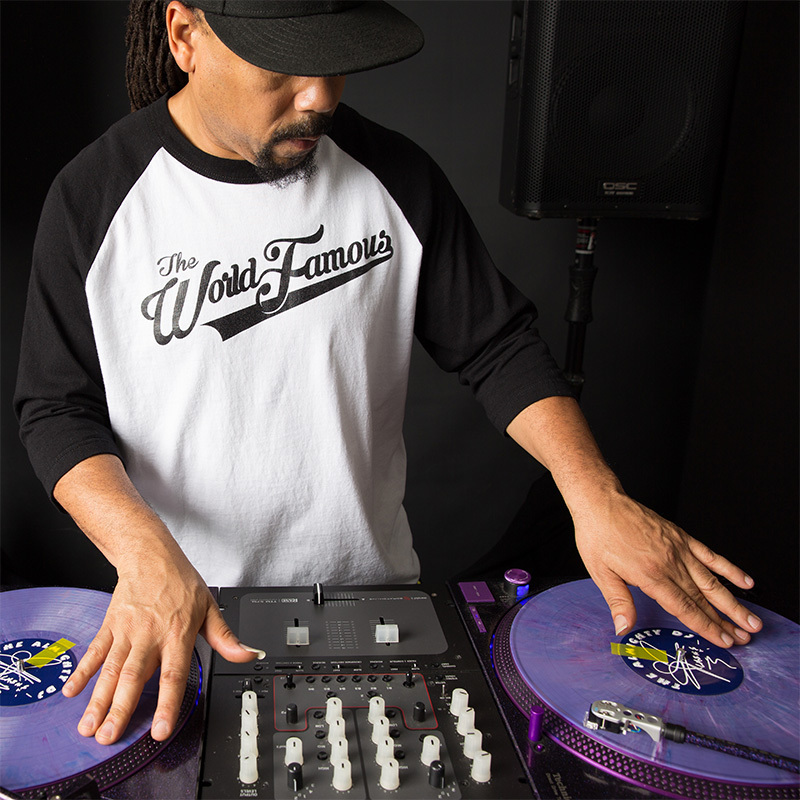 In the 90’s, he teamed up with 2 of the hottest Bay Area D.J. Organizations – The Original D.J.’s & The World Famous Rick & Russ Show. Currently, they play for a variety of venues around the country including The Los Angeles & Berkeley Jazz Festivals, The Old School Funk Fest (hosted by KBLX), and international events (Canada, Dominican Republic, Aruba). In February 2008, C.J. joined the Katt Williams’ “It’s Pimpin’, Pimpin’” nationwide tour. For over 100 shows, C.J. played to thousands of people 5 times a week! C.J. also shares his knowledge, talents and influence with a large number of Bay Area artists, radio and club D.J.’s throughout the music community. In 2010, C.J. created and hosted “Live @ The BBQ”, a premier weekly Sunday afternoon adult mixer located at Kitty’s in Emeryville, CA. Currently he (with The World Famous Rick & Russ Show) entertain for a number of events including a Friday evening “Happy Hour” mixer at 3000 Broadway Sports Bar/Restaurant (Oakland, CA), a “Live” internet radio show on Celebdjs.com, “The 5 o’clock Flashback Mix” and “The Saturday Night Get Down” with Victor Zaragoza on 102.9FM KBLX. C.J. also continues to DJ (open) for musical notables such as Earth, Wind & Fire, Charlie Wilson, Robin Thicke, Trey Songz, Nicki Minaj and Jay-Z.